Thanks to Helen of Chalets USA for this update on Colorado resorts - winter will be here before we know it! "It’s snowing in Colorado USA – September 2012! There aren’t many months of the year that it doesn’t snow in Colorado - locals will tell you they’ve seen white flakes every month of the year and in a typical year it’s really only July & August that miss out. This year is no different and bodes well for the upcoming ski season. Several Colorado resorts including high altitude resort Breckenridge & Winter Park saw dustings of snow on the peaks early September. This was followed by another storm 19 Sept and yet more 25 Sept which covered the bowl areas & many ski runs in the Winter Park / Mary Jane area. While the Aspens in the valley are still turning their gorgeous yellow colour and tourists are visiting the turning trees, the slopes are starting to get a good covering ready for ski season. As usual Arapahoe Basin & Loveland ski areas are competing to be the first to start their lifts running in October. This will be followed by several of the major resorts mid November. Breckenridge plans to open on November 2, “Colorado’s favourite” Winter Park on November 14 and Vail on November 16. The following week Beaver Creek “not exactly roughing it” is scheduled to open as well as Steamboat, official home of “Champagne powder”. Thanksgiving day will see skiers whizzing down the slopes of Aspen & Snowmass. By the time the crowds arrive for Christmas and New Year the resorts will have been up and running for over a month, ready and raring to please skiers and boarders alike." Thanks Helen for the good news - take a look at Colorado ski holiday options! Anyone out there with European updates please get in touch as we'd love to hear from you! Pre-season fitness tips and exercises for better skiing by ski guru and elite instructor Mark Gear. There is no better physical training for skiing than skiing itself. The majority of people who ski partake in the sport for 2-3 weeks per year. So its probably safe to say that more enjoyment can be had by most skiers, if they physically prepare for those precious days on the mountain. This is not intended to be a set programme, but aims to provide insight for how to train more specifically for skiing. To take your dry land ski training more seriously, head down to your local gym and ask for help from the professional staff to design a personal programme. This really can do wonders for your skiing. It's best to be in good physical shape before starting a strength training programme. Check with your doctor before starting a physical fitness programme. Any exercise you can do before your ski trip will certainly help. However, an 8 - 10 week ski specific programme of 3-4 training sessions per week can help dramatically. Starting with strength training and ending with plyometric training. This will help prevent your legs from burning half way down the slopes and reduces the risk of injury. More about Plyometric training later. Cross training through different sports is a great way to improve general fitness for skiing and will help most recreational skiers. Any sport that involves moving the legs and getting the heart and lungs working is a good place to start. Running, jogging, cycling, swimming and tennis are great sports to prepare yourself for the coming season. Flexibility is an important part of training for any sport and can help reduce the risk of injury. It is important to take the time to stretch straight after each training session, whilst the muscles are still warm. This kind of training includes initially strength training with weights and secondly plyometric training. Once strength has been increased, plyometric training can later be used to improve speed, agility and power. Ski specific training, as the name implies, aims to target the muscle groups used in skiing and to use them in a similar way to skiing. The following exercises not only increase strength, but also balance skills which are important for skiing. The exercises should be performed in repetitions and sets. Again it's best to ask a fitness trainer for help at your local gym to design a personalised programme. Free weight squats (no machine), for improving whole body strength and balance. This exercise really targets the legs and core which are important muscle groups to strengthen for higher performance skiing. It is important to perform squats with the correct technique. 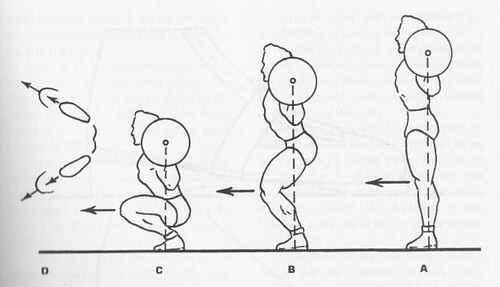 Care should be taken as poorly performed squats can cause injury. Warm up first with low weight or no weight. Use someone to spot you. Keep your head up and look forwards with eyes open. Keep your chest pushed out in front. Keep your feet in a comfortable symmetrical stance. Keep your feet flat on the floor through each squat. The lunge also targets the major muscle groups used in skiing. Precaution should be used to ensure correct technique. The emphasis should be on quality, balanced and smooth lunges without too much weight. Warm up first without much weight. Use someone to spot you when lifting more weight. Stand with one foot forward, the other back. Both feet should be facing straight forward. Be sure your front knee is over your front ankle. Lower your back knee almost to the floor, and rise up again. Concentrate on squeezing to push yourself up, keep the abdominals tight and the lower back in a neutral position. Maintain the body in an upright position with a straight back to avoid leaning forward. One leg squats can be more difficult to perform as balancing is more challenging. It's best again to start with low weight. When comfortable with the technique, weight can be held in each hand or on a bar held behind the neck. Try placing a cushion under the front foot to really target your balancing skills. This helps to strengthen the little muscles used for balance in the legs and core. Plyometric training involves high-intensity, explosive muscular contractions that encourage the stretch reflex (stretching the muscle before contraction so that it contracts with greater force). Sounds complex although most plyometric exercises are simple. The most common plyometric exercises include hops, jumping and bounding movements. This type of training is typically done after a strength training programme. Plyometric exercises can enhance agility, speed and power which are important components of higher performance skiing. 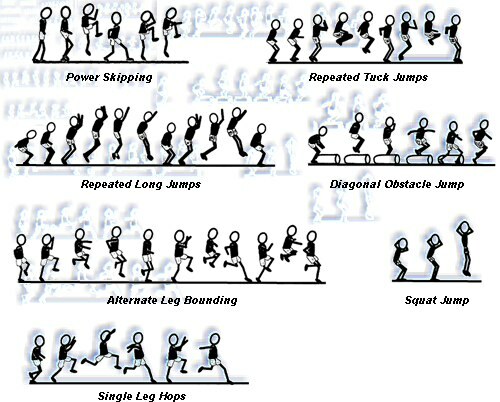 Lateral jumping simulates many movements that are used in skiing. Bending and stretching of the legs with agile lateral movement, including flexing of the ankles, knees and hips. Aim to keep good control and balance, landing and taking off with both feet. Control leg symmetry in lateral jumps. Aim to keep your knees and feet the same distance apart. This is an ideal stance for skiing. Developing this kind of control can really help build stability and symmetry into your skiing stance. 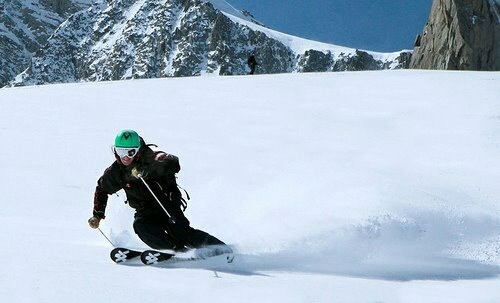 By Mark Gear Head ski coach at All Mountain Performance Chamonix.